Welcome to the Big Island of Hawaii. Here you can play in the snow, hike the valley trails and frolic in the surf while the sun goes down all in the same day. 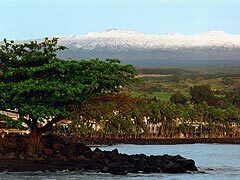 We are located in Hilo on the East side of our island. This island has many unique properties and homes. This can be a challenge for lending institutions that are not familiar with our islands. We ensure that the underwriters with the lenders we work with either have presence here in the islands or are very familiar with the properties here. With a land mass bigger than all the other islands combined you can build the home of your dreams on land that dreams are made of. We can help by providing vacant land and/or construction financing. If you already have your piece of paradise and need money for expanding, paying off debt, or just having fun call us to discover your options. We pay attention to details and your individual needs to complete your loan in a smooth and timely manner. With over 55 years of experience we handle every loan with Honesty, Integrity, and Quality. This is our commitment to you. Derrick Umemoto sets the standard for the company. Derrick’s knowledge of the mortgage industry and its laws are extensive. With that knowledge he has been involved with issues such as having the Veteran’s Administration accept homes with water catchment systems. He helps people navigate through the mire of mortgage requirements and his primary goal is to help anyone hoping to own their own home. He approaches each situation by placing himself in the shoes of both the home buyer or owner and the lender so he can determine the best strategy. Buyers understand that Derrick has their best interest at heart and that he strives to help them reach their dream of home ownership. Linda Wong is a well respected mortgage broker with over 30 years experience and has a wealth of knowledge that she applies to every transaction. She inspires the highest level of confidence from both clients and peers. Her loyal following will attest to her caring attitude and her ability to proficiently execute her loans. Having been born and raised in Hawaii, the “aloha” she feels for her family, friends and home motivate her to help others achieve the same. Charles Umemoto is dedicated to helping his customers in building or purchasing their dream home. Charles was born and raised in Hilo, bought his first home in 2003 then went on to build his own home in 2005 where he enjoys his family and rebuilding classic cars. After going through the steps of purchasing and building a home himself he understands the hurdles of getting home financing. He has helped numerous people with building their home and navigating the requirements of home building.